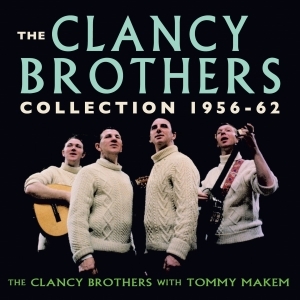 The Clancy Brothers, more than any other artists, brought traditional Irish folk music to a wide popular audience during the late ‘50s and early ‘60s, and re-established as a proud cultural movement in their native country as well as becoming major stars in the USA, where the huge community of Irish emigres and their descendants latched on to the music of their roots. Turning to music from acting after emigrating to the USA after WWII, they brought a boldness, panache and professionalism to a style of music which had largely hidden its light for a long time, turning it into an entertainment phenomenon that transcended the folk genre, as they found fame on the Ed Sullivan Show, and became one of the focuses for the massive folk revival of that time. This great value 62-track 2-CD set includes all the tracks from their three LPs for their Tradition label which established their reputation, the songs from their first ‘live’ album on Columbia which were unique to that release, and the entirety of their lesser known 1962 Columbia album “The Boys Won’t Leave the Girls Alone”. It’s an ideal collection for anyone wanting a comprehensive overview of the recordings that established them on the scene, and which brought traditional Irish music to a wider market.